2006 Mathematics Game challenges students to "use only the digits 2, 0, 0, and 6, in any order, with the operations +, -, x, ÷, ^(raised to a power), sqrt (square root), and ! (factorial), to write expressions for the counting numbers 1 through 100." Students may submit solutions online to the Math Forum. Check the rules or download a recording worksheet at this site. 2005 Mathematics Game challenges students to "use only the digits 2, 0, 0, and 5, in any order, with the operations +, -, x, ÷, ^(raised to a power), sqrt (square root), and ! (factorial), to write expressions for the counting numbers 1 through 100." The Million Dollar Mission: a Mathematical Fantasy in which students must choose which payment plan will give them the most money. Featured Link: Do You SuDoku? The Sudoku Puzzles have become very popular with adults. The challenge is to place each of the digits 1-4 or 1-6 or 1-9 in each box within the larger puzzle box so that no digit appears twice in any row or column. The puzzles require logic to reason through the placement of specific digits and the ability to scan the entire puzzle for starting clues. Now teachers can also use this popular format with students, thanks to this SuDoku for Kids website. Daily SuDoku for Kids presents easier versions of the SuDoku puzzles especially designed for younger students. Each SuDoku is rated as easy, medium or hard so that teachers can select the most appropriate versions for their students. An archive of past SuDoku problems and answers are available and are easily printed for use with students. Consider introducing this problem-solving activity as an enrichment or center activity for interested students. Solving the problems requires logic, methodical approach and persistence. 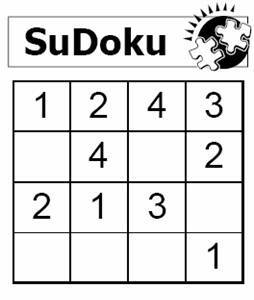 Download the SuDoku Templates (both 4x4 and 6x6 grids) to use as a reusable overhead or place the templates in sheet protectors so that students can use dry erase markers to solve the posted SuDoku problems and then reuse the templates for future problems. Both 4x4 and 6x6 SuDoku problem grids are included so that teachers are able to differentiate problems for students in their classes. These activities support student development of the concept of patterns through concrete activities with manipulatives, The use of variables is developed as a mathematical way of recording the general rule. Five Coins and the Magic Doubling Pot challenges students to analyze two patterns to see which yields the most money. 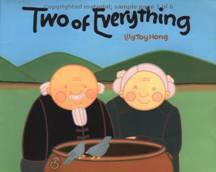 This activity is designed to build on reading and enjoying the doubling pattern in Two of Everything. 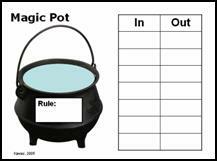 Download Magic Pot Workmat for students to use in sheet protectors. 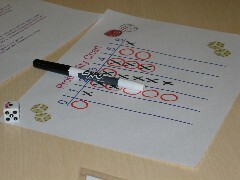 This mat is also used to record input and output numbers in the Guess My Rule game. Early Algebra, Early Arithmetic is a collection of algebra lessons and activities. The Variable Machine: an introduction to variables as replacements for numbers. Algebra: Fun with Calendars examines the patterns in adjoining calendar dates. Download Guess My Rule Game: one student gives an input number and the other student uses the rule to give the output number. The input number student continues to supply numbers until he can guess the rule. Read Three Pigs, One Wolf, and Seven Magic Shapes. 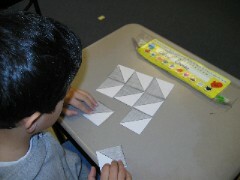 Ask students to recreate the tangrams that illustrate the story using the tangram mats and commercial tangrams. 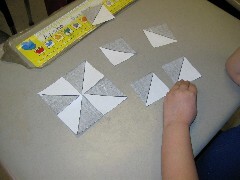 Challenge students to create their own tangram designs and combine into a class book or math center. Read Grandfather Tang's Story and ask students to recreate the tangrams that illustrate the story. Challenge students to create a story page with new tangrams for animals that could be added before the end of the story. See The Geometry of Quilts webpage for quilting activities and literature connections. Paper Quilts is a series of 8 lessons that develop the concepts of fractional parts, transformations and symmetry. Sew, You Want to Quilt? introduces students to the use of patterns in quilts. Students also examine patterns in the artistic quilts of Faith Ringgold. Patch Tool lets students create a quilt patch using pattern block shapes. Quilt Blocks by Type is an online picture reference for standard quilt block designs. Quilts: Shape and Space in Geometry examines different types of symmetry found in quilting patterns. Freedom Quilts: the Kennedy Center ArtsEdge Lesson Plan that studies the use of transformations and symmetry in the Freedom Quilt patterns. Students create their own Freedom Quilt. The Underground Railroad: a Study Guide for Teachers and Group Leaders introduces students to the secret codes used to pass information. The code section also discusses the use of quilts to send messages. Students can research the common patterns used in the Underground Railroad and study the geometric transformations used to create each. Threads of Freedom discusses the Underground Railroad and how quilts were used to give directions. Symmetry Around the World project has links to many real-life examples of symmetry. Kaleidoscope Painter allows students to drag the brush around the applet window to instantly create a kaleidoscope picture. 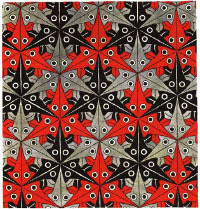 This is a great introduction to the underlying symmetry of kaleidoscope designs. The Symmetrizer has an interactive How? feature that explains how mirror symmetry creates the familiar kaleidoscope designs. These activities support students as they answer questions about the world around them. Learning to organize and analyze data are important life skills that students will use in both their professional and personal lives. Create a Graph allows students to input data and create a graph online. Landmark Shark Game is an online Everyday Math game in which students use the landmarks of mean, median, mode and range to win points. Make your own spinners and print them in black and white or color to meet the needs of any game or activity. Ken White's Coin Flipping Page allows students to generate data from many coin flips to better approximate the actual probability. What Are Your Chances? 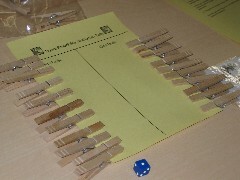 allows students to input how many times they want to virtually toss 2 dice. 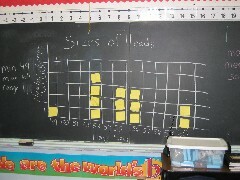 Then students see a bar graph and table of values for the dice throw. 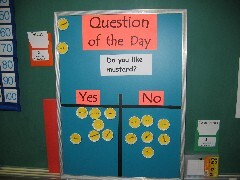 A List of Daily Math Graph and Yes/No Questions targets the K-2 population and is a great resource to use with the clothespin graph or Question of the Day yes/no format shown in the pictures. What's in a Name? uses the length of names for a data-collection activity. Use the book Chrysanthemum as an introduction to this name activity. These activities help students develop an appreciation of how discrete math is used to represent and solve problems in real-life situations. A MAP-ematical Dilemma: how many colors do you need to make a map? Traffic Jams in the Messed-Up City Activity is a John Conway activity that involves a map of one-way streets. Players choose which way move cars along the streets leading from one destination, being careful to avoid the "jam destination" as no routes leave this destination and the player loses. Students will develop logical thinking as they think ahead to choose the best options. Crypto Kids introduces students to codes and cyphers. Students can learn different ways to make their own secret codes by watching the presentations on this site. Nova Online: Decoding Nazi Secrets teaches students how to crack simple codes. 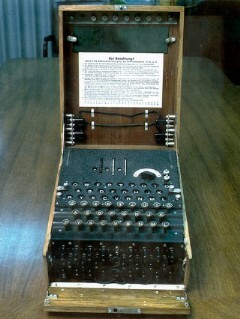 Students then use NOVA's Virtual Enigma Machine to encrypt and send the encoded message with a special key that allows that recipient to decipher the message. Caesar Cipher introduces students to the simple linear transformations used to encode messages by substituting one letter for another. These codes were reputedly used by Caesar as they were easy to produce. Students are challenged to break the code so that they understand that it is fairly easy to break these kinds of codes. Caesar Cipher II provides more practice in encoding messages. Caesar Cipher III challenges students to break the code to decipher the message. Enigma Machine: See Enigma Machine on Wikipedia for more information on how this coding device was used by the Germans during World War II. Picture is from this Wikipedia entry. These projects help students develop an appreciation for how math is used to represent and solve problems in real-life situations. Internet Project Registry is described as "the original clearinghouse for collaborative projects from across the globe - projects hosted by the Global SchoolNet Foundation, other reputable organizations, and outstanding partner projects conducted by teachers worldwide! Whether you choose to join an existing project or announce one of your own, GSN's Projects Registry promises to save you time!" Databasing Our Way Across the USA is an open project from 11/16/05 through 12/16/05. Students may complete a survey online and the data will be used to determine if there is a "typical 5th grade student." George the Geometric Giant encourages students to use technology (cameras, camcorders, etc.) to "capture various aspects or subjects particular to their community that inspire Mathematical thought. Students then create 4-8 math word problems that relate to what they found." The project runs from 11/04/05 through 6/02/06 for 9-16 year old students. Great Game Swap II encourages teams of students to develop a mathematical strategy game then swap with a team from a different school. The project runs from 1/04/06 through 4/28/06. 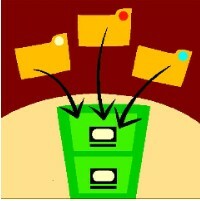 TechnoSpud.com Projects are projects in which students share results online with other classrooms around the world. Double Stuf Oreo Project is complete but this data collection project could be replicated by students. 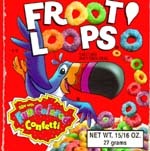 See Froot Loops to the Max 2003 for interdisciplinary counting and sorting project. A new version begins on 1/9/06. Registration begins on 12/10/05. See TechnoSpud.com Projects for more information or to register your class for the project. Searching for Solutions: is a Web-based Problem Solving Unit in the form of a webquest. A Fractals Unit for Elementary and Middle School Children is designed to teach younger students about the mathematics behind the pretty pictures of fractals. What in the World Is A Shape? The Titanic: What Can Numbers Tell Us about Her Fateful Voyage?" What's the Cost of Your Dream World? These open-ended problem solving tasks challenge students to apply mathematical concepts and language to everyday problems. Students also learn to explain their thinking using words, pictures and numbers. The use of a problem-solving rubric helps students target a best performance by using the prompts found in the rubric. Math TV: Problem Solving Videos are problems submitted by students and are aimed at a middle school level. These links challenge students to develop logical thinking and use patterns to solve these puzzles and brain teasers. NCTM Illuminations Web Resources are organized by NCTM Standard and include selected web resources for Grades PreK-12. Project M3: Mentoring Mathematical Minds addresses the needs of the gifted mathematical student.